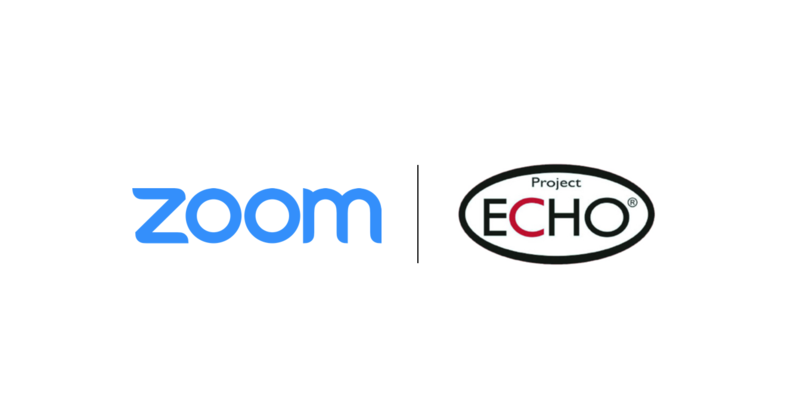 July 2018 marks five years of partnership between Zoom and our friends at Project ECHO. To celebrate, we wanted to share the story of how Zoom and Project ECHO work together to share medical knowledge that saves lives. Project ECHO was founded in 2003 by Sanjeev Arora, MD. At that time, there were an estimated 20,000 patients diagnosed with hepatitis C in New Mexico; however, Dr. Arora was able to treat less than 7% of them and there were very few other hepatologists in New Mexico. Dr. Arora said, “The process was extremely inconvenient – patients would have to make up to 20 trips for treatment, which sometimes meant driving for 200 miles, taking time off work, leaving children at home, and so forth – not many could afford it. Since hepatitis C is a fast-developing disease, damaging one’s liver, numerous people were developing liver failure and dying due to not having competent, accessible medical care.” The situation was disheartening for the local primary care provider, so Dr. Arora came up with a solution to connect doctors virtually to mentor them so that they could provide high-quality care locally. Project ECHO is a knowledge-sharing network that links expert medical teams with primary care clinicians in rural and urban underserved locations. This model of continuing professional development makes providing best practice care to underserved people all over the world possible. In a typical case, a local clinician in a rural area connects with medical specialists via Zoom to share details of a patient’s complex condition. After receiving expert advice, the clinician finalizes their decision and recommends appropriate treatment for the patient. As a result, best practices and medical knowledge are democratized, making high-quality medical practices accessible to medical professionals in rural and medically-underserved areas around the world. Since developing and implementing the first teleECHO program, it was a major challenge to find a video communications platform that would deliver high up-time and was affordable for partners around the world. While Project ECHO had successfully utilized a legacy hardware conference room system from 2003 to 2013 to support programs in New Mexico, this system’s appliances cost ECHO hundreds of thousands of dollars and it simply wasn’t cost-effective for ECHO to purchase appliances for every ECHO hub and spoke across the US and around the world. In some cases, ECHO had to purchase two sets of each appliance in case an appliance failed in the field. Dr. Arora, founder and Director of Project ECHO, said, “It cost us about $5,000 to purchase cameras, so we installed them in a couple of locations, and doctors would have to make a trip to those stations to join a video meeting.” The lack of scalability became a limiting factor in Project ECHO’s expansion. To support worldwide scaling, Bill Szaroletta, technology and innovation officer at the ECHO Institute, made it a priority for the institute to move to the cloud. In mid 2013, Project ECHO made the decision to switch to Zoom after Szaroletta and his team evaluated almost two dozen alternatives. Zoom was selected over these alternatives because of the extremely high performance-to-price ratio, the high-availability of Zoom’s cloud-based infrastructure, and the ability to utilize off-the-shelf components. “Before rolling Zoom in 2013, it sometimes took ECHO from 6 to 18 months from the time of signing up a new partner to having the legacy system purchased, installed, people trained, and everything operational. With Zoom, ECHO now takes less than 18 seconds to provision an account for a new ECHO partner and about a month to become operational,” says Szaroletta. Zoom addressed all of Project ECHO’s video conferencing challenges. Zoom offered cloud video communications that didn’t require complex hardware to be installed in every clinician’s office; it was affordable and provided an instant connection that was just a click away. Zoom was intuitive and user friendly; moreover, clinicians could use it on their laptops, cell phones and tablets from anywhere. Another important factor was the ability for a clinician to watch a recorded tele-mentoring session if the clinician couldn’t attend the ECHO session and participate in ECHO’s learning loop. Zoom’s standard MP4 and M4A recording ability easily met this need. Zoom’s powerful screen sharing and collaboration tools were a boon for Project ECHO, which typically utilizes two ultra-high-definition displays during a teleECHO session; one to see the session participants and one to see the shared content or the active speaker. Project ECHO expanded tremendously around the world after switching to Zoom. Back in July of 2013, when Project ECHO first rolled out Zoom, ECHO had 13 Domestic Hubs, 1 International Hub, and one multi-site VA program. 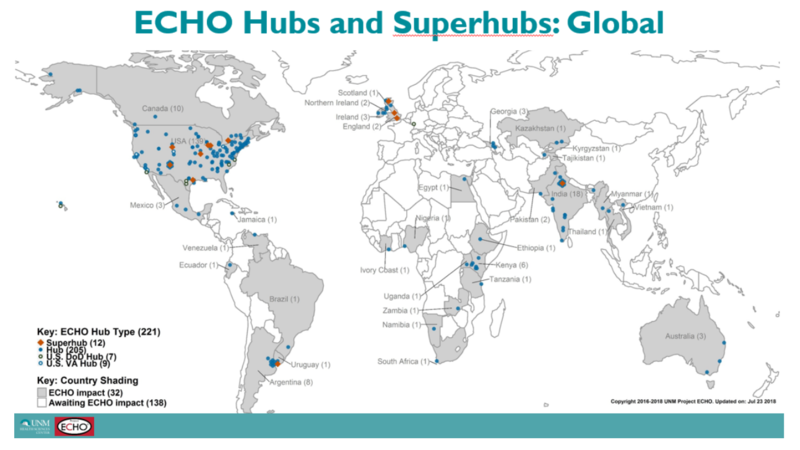 Within five years of Zoom adoption, ECHO now has over 220 hubs, more than 135 domestic hubs, and over 80 international hubs in 32 countries. Much of the global expansion has been possible because of Zoom’s ability to work well over 3G and 4G cellular networks in many developing countries. As a strong partner of ECHO, Zoom has been a technological cornerstone to make this tremendous global expansion possible both financially and logistically. Currently, there are more than 55 focus categories for ECHO programs and over 200 partner programs; each program has its own team of medical experts that specialize in different diseases or populations. These experts hold regular, Zoom-powered teleECHO sessions with practicing clinicians located in rural or medically underserved areas, where the latter present case histories of their current patients. Using Zoom, the experts who are often geographically displaced discuss complicated health problems and help the clinician decide on the best treatment for their current patients. Through this process, Zoom has helped spread expert knowledge to build capacity to keep healthcare quality high, regardless of location. In 2025 Project ECHO and Zoom will have successfully collaborated for 12 years. It will also be a milestone year – Project ECHO has a goal to positively impact the lives of 1 billion people by 2025. The last five years of ECHO using Zoom has made a significant difference in Project ECHO’s growth – their motto is “Moving knowledge, not people,” and Zoom is a core component that actually makes it possible. Many medical professionals who are also educators have had an opportunity to use Zoom through Project ECHO and have realized that it’s the best video communications tool available on the market. This has led to educators bringing it up to their administration, resulting in many top universities across the US and around the world purchasing Zoom for both administrative and e-learning purposes. “Zoom has been a powerful partner for Project ECHO and will be into the future as we continue to grow and scale the ECHO model around the globe. We have had such success with Zoom that we have negotiated and signed three contracts with the Zoom team, with the third stretching through 2025. Zoom’s flexible and powerful service enables us to easily connect our existing legacy room systems while allowing ECHO to comply with information security and privacy regulations,” said Szaroletta. “Project ECHO’s worldwide rate of growth has been significantly increased as a result of our strong partnership with Zoom. We look forward to continuing leveraging our partnership with Zoom to help the ECHO Model address complex problems,” said Arora. “Zoom is proud to be a part of this important effort to reduce rates of chronic disease and improve healthcare in rural areas. We have worked with Project ECHO for years, and we’re pleased that they will be able to scale their programs far and wide. It is rewarding to see our secure, easy, compliant video communications platform help this important mission,” said Eric S. Yuan, founder and CEO of Zoom. Sign up for a 1-on-1 demo with a Zoom product specialist today!